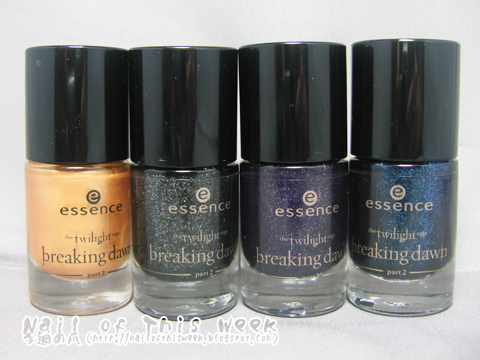 Swatch: essence the twilight saga breaking dawn LE : Nail of This Week. Ah…hem. I know there’s TONS of Twilight fans but I must start the post to define myself as; I’m not a fan of Twilight saga. So sorry but I even HATE it. I just really can’t understand why it’s so big, popular and beloved…Well, I dislike pretty many stuff which is widely accepted, so probably this might be the part of it. Anyway, I’m not a fan of vampire-themed stuff too…BUT THIS LE. 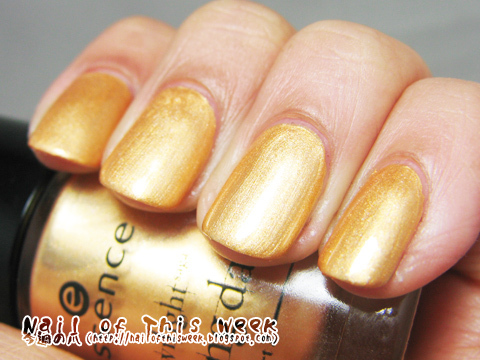 Seriously, this essence’s LE TOTALLY caught my eye and I could hardly resist them. Also, unlike Snow White LE, they’re only 4 polishes…alright why not grabbing them all? :P So that’s why I have all 4 polishes here, and decided to show the swatches of all these!! Edward’s love is a black packed with silver and multicolored glass flecks. This one was very hard to capture, that mostly silver flecks appear very strong but not multicolored one. It’s clearly there IRL! Also looks bit griddy and rough but actually it’s not; flecks can be completely smoothened with one tice coat of topcoat. Full coverage with two coats but better for three. Alice had a vision - again is dark purple jelly with rich amount of teal/blue/purple glass flecks. I’m not a great fan of purple but I’m so in love with this one…so smooth, so juicy and squishy, not too strong but very deep! I love the color on the nail better than in the bottle, now I’m thinking probably I need spare bottle :P Good with two coats, but here is three coats. Jacob’s protection is black jelly packed with tons of blue/green/multicolored glass flecks. 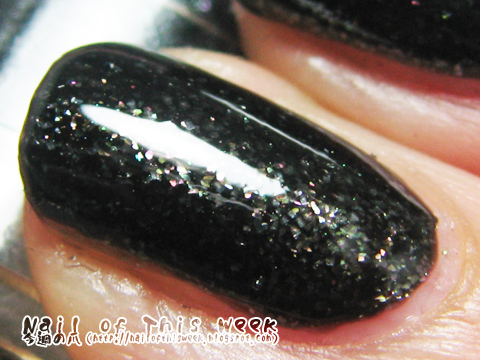 Yes, you read right, it’s BLACK jelly, not even dark navy, it’s totally black on it’s base color, and it really gives nice depth in the color especially on the nail itself. This one is definitely my favorite in all shades, I didn’t get the backup bottle for others but THIS :D Enough coverage with two but here is three coats. I really love (and own) Alice had a vision, Jacob's protection and A piece of forever. 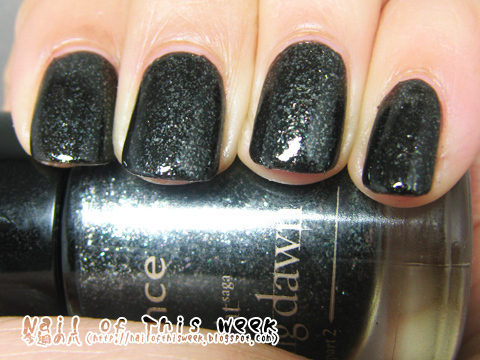 <3 Edward's love is too similar to the Vampire Love's nailpolish no. 05, which came out a year ago. Today Jacob's protection was in my mailbox and wow... It is in reality so much more beautiful and I'm so happy to have it! Still waiting for the other bottle. At first my boyfriend cursed you because of the trouble he had with purchasing these two, but as he saw my happy dance he wasn't so sure if he shouldn't thank you instead. Thank you, I don't want to have missed this!! !